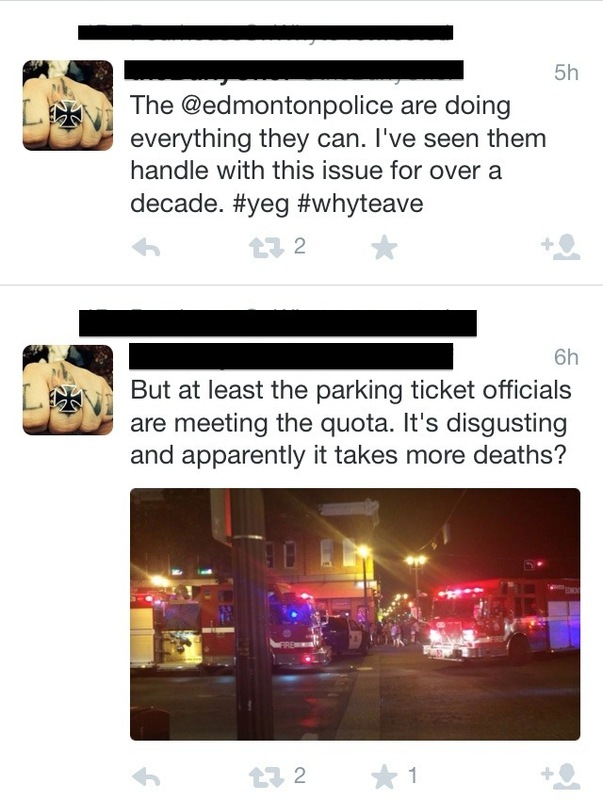 All right: it’s time for me to weigh in on a growing social media trend here in Edmonton. You may have heard of it – public shaming of bad parking in local places, particularly of the “he’s clearly over the line! *finger point*” variety. I don’t care one way or the other about the agenda – my husband has submitted photos, and there are some really bad parking jobs out there – but last night one of the founders used his new fame to rant about a parking situation he feels is continuously appalling. Namely, the set curfew for parking along Whyte Ave, one of the busiest pub and nightclub streets in town. He starts off with a little public shaming of the police force. Sure, that’s tasteless, and he doesn’t use the actual police force twitter account to tag them, but so far we are just venting about a frustrating situation. 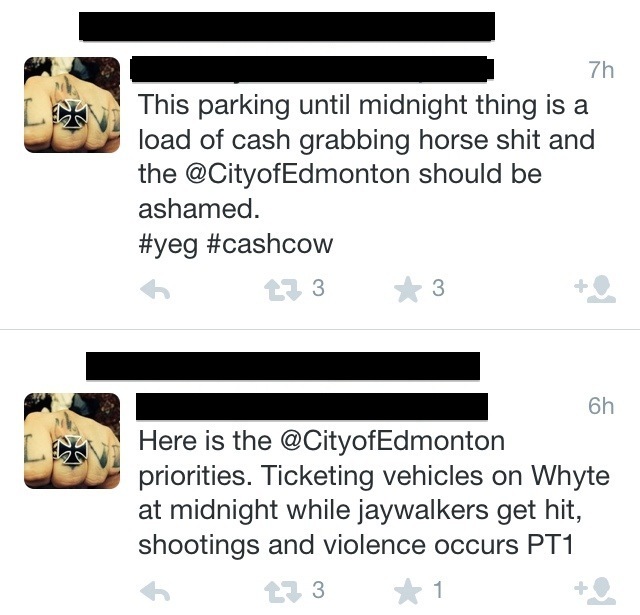 And I’d like to point out something about the “jaywalkers hit” comment – the reason parking on Whyte Ave is restricted and not allowed after midnight is precisely for this reason: drunken jaywalkers deciding to cross the street erratically from between parked cars, making it extremely difficult to see them. The reason for the curfew is to make the sight lines of drivers using the avenue less cluttered when the likelihood of said drunken jaywalking will occur. Now he makes a bit of an intuitive leap. Apparently emergency vehicles parked in the street on a busy Friday night of a long weekend immediately means someone died. Oh, and there’s the police twitter account popping up now. Better late than never. He does also mention in another post his it’s a really busy night for the police as there is a riot at some concert in town. Truly, this is then the night to go all righteous anger social media warrior on their asses. I’d like to point out here that NO ONE EVER DIED FROM AN IMPROPERLY PARKED CAR. Sure, lots of people have died as a result of being idiots around parked cars, but never has the parked car itself caused the event. Having been the victim of a near death experience thanks to careless drivers while I was properly using a lighted intersection to cross a street, I can tell you that all it takes is one inattentive person behind the wheel of a moving vehicle to take a life. An inattentive person with a parked vehicle usually just results in getting tickets for or, at worst, towing of said vehicle. And here’s the Mayor’s take on all this. I’m sorry, but I’m with him. This is not the way to gain sympathy for your cause. If you want to make a difference in the parking situation around your place of business, particularly where the situation may adversely affect you and your customers, the proper course of action is to for a group of like-minded concerned business owners in the area, create a petition for your customers all to sign, and head directly to City Hall with petition in hand to personally address the council and plead your case. Even better if it’s a petition to create more parking in the Whyte Ave area rather than redefining the parking situation of the avenue itself. This? This is not the way. 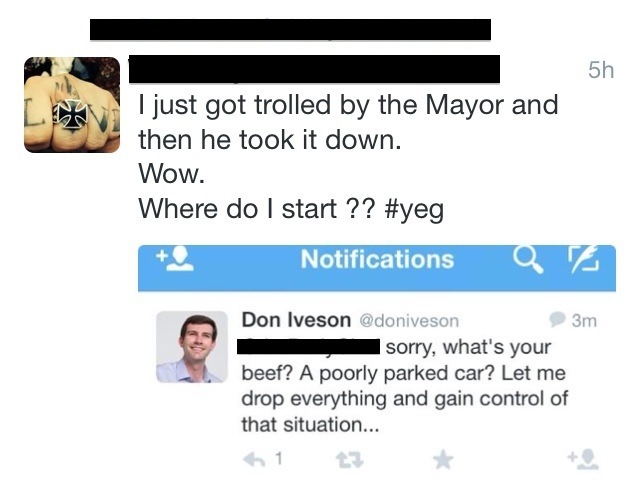 As I also follow the Mayor’s twitter account I can assure you that he gets more than enough tweets regarding parking, potholes, snow clearance and neighbourhood nuisances to make any sane person cringe. A situation like this where civic duty could be actioned with the proper steps taken probably gets his goat. It would certainly get mine. A student frustrated at the amount of homework he’s been given wouldn’t tweet to the teacher and call them out in front of all their other students about how unfair it was, and just expect the teacher to tell him it’s suddenly not due. That’s not how social justice works. Do your due diligence. If you want change, be the change. Make the time to make it important to you. Do not whine about it on a social media site and expect dramatic results. And don’t ever, EVER diminish the pain and suffering of others to elevate your cause. That’s not doing it right at all. That’s just making yourself look like a complete jerk. It has been snowing since last Friday. I don’t say this so you can pity Edmonton and its residents, but rather so that you can understand: the average cummulative snowfall for November (the entire month) is 18 centimetres. This week alone it has snowed over 50 centimetres. That’s nearly 2 feet of snow in a week, people. This is a thing. MiniSir went back to work last Thursday and Friday after being in Wainwright, and since one of the senior captains went on leave and left no instructions or delegations, MiniSir spent two days sorting out his own stuff as well as this completely different full-time job. Which wasn’t a big deal at home except for the Blackberry going off all weekend and through into this week, because even though the other captain is back now no one is getting any direction from him still so they are continually asking my husband. No private time with my love after he’s been gone for months because ARMY? This is a thing. My new car Watson suffered injury when the block heater cord completely fell apart in my hands last week. Luckily, the temperatures this week only went down to -30C at night. I took him for an assessment so they could order a part, and then back again this week so they could fix him. That is an entire day of driving/being driven around the city because the dealership is in St. Albert and I refuse to be pregnant and waiting for hours in the waiting room at the garage. Add on the amazing traffic because of the continuous snow? This is a thing. Yesterday I was so happy for a day that I didn’t have to leave the house because I was just done (slept til noon, crying, etc.) that I completely missed my appointment with my psychiatrist. When you’re so overtired and depressed that you miss the appointment with the one person who can help you? That is a thing. Every single nice thing I can wear to cover my legs stopped fitting this week. I don’t blame Sonic, but I mean really – hurray for yoga pants. Yep, that’s a thing. My step-children’s new step-father decided to send my husband insulting passive-aggressive text messages about how he was a bad father, and when MiniSir didn’t kowtow and instead stood up for himself, said step-father told him he must be drunk and to go “sleep it off, tiger”. On a Wednesday evening at 8pm. This is a rage-making thing. I actually feel good enough to post this list. And that, my friends, is probably the biggest thing of all. Flat-Out Friday: My Official Title is "Lady Who Lunches"
Ah, Friday. When I’m all wound up I can always count on you to be so cathartic. And after my “buying a mom-mobile” experience this week, I can use catharsis. So MiniSir and I had already planned to get a second vehicle once the time was closer for Sonic to move from being an on-board passenger to a party of one. And I have said since the beginning of our “if we ever have kids” dreamtime that, if it happens, my ultimate Mommy vehicle is a Honda Element. So reliable, so roomy, so durably lined with hard plastic. Even though they don’t make them new anymore, I have had my eye on them for ages. My car suddenly stopped being MY car. Because, even though I am perfectly well off by myself, I don’t have a job. And banks don’t let you finance anything if you don’t have a job. So MiniSir’s name had to go on the bill of sale as well. I didn’t really mind this, but it was a little irksome, particularly when the financial guy showed us our credit ratings and mine was higher. But whatever. I had a car. MiniSir called his insurance company and had them create a policy for me so I could drive it home as soon as possible, so we arranged to pick it up the next day. While he was at work I went down to the Registry to get my plate and register my car, all excited about being a new car owner. Did you know that if there are two names on the bill of sale the Registry will not let you register the car in just one? Neither did I until I got there. Defeated, I went home to wait for MiniSir so we could go together and register my new car. He was allowed to come home a little early to sort this all out before he left for Wainwright the next day, and together we went back to the Registry to register my new car. Did you also know that if the insurance policy is under one person’s name, even though the car is listed as the other spouse being the primary driver, the car can only be registered in the name of the person listed on the policy? NEITHER DID I UNTIL THEN. I had to sign an affidavit letting my husband register MY car in HIS name so that I could go get MY car off the lot. 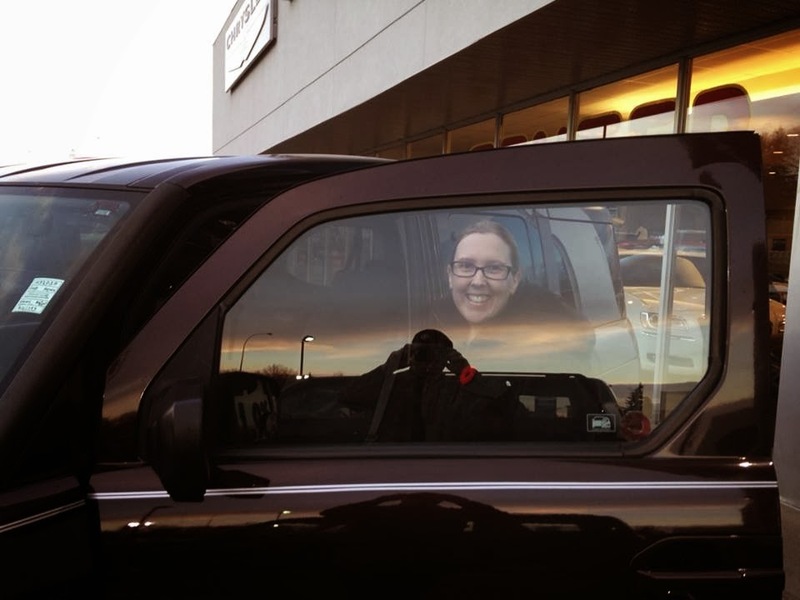 And thus I was no longer the proud owner of a car; I was just the person allowed to drive my husband’s second vehicle. Here’s what really really REALLY gets my goat. If I had had a job, MiniSir’s name wouldn’t have been on the bill of sale, which would have let me register the car myself as long as I had my own insurance as well. Which I take from society to mean the following: Get a job, keep a job, don’t get married, and don’t have kids. Well done. As one of the declining number of couples who decide to have children, I want to thank you for supporting my husband and I. When your failing public works systems are collapsing, remember all those people that wanted to contribute to the economy but couldn’t because you were just too judgmental. Meanwhile, I’m gonna go stick girly decals on my husband’s new Element. Excuse me. It’s not like I wanted to. But I woke up, made some breakfast and did the dishes, and went back to bed, sleeping soundly until Matt called on his way home from work. My doctor wants me to be swimming up to three times a week, and as much as I’d like to accommodate her, if I swim one day, I need a day of rest to make up for it. So I could swim Monday, rest Tuesday, swim Wednesday, rest Thursday, and swim Friday, but that would mean Saturday would be a day of rest and as much as I would love to get in shape quickly, spending time with my husband is far more important to me. Is that wrong? She’s pleased with my progress as a whole, since I’ve permanently lost weight while also losing fat and gaining muscle tone. Not too quickly, mind you, but in a strong and healthy way. I am interested in getting up to swimming three times a week, but I also need to figure out if that’s really the best course of action for me, or if it’s pushing a little harder than I should be at the moment. I believe I’ve made mention of the troubles I’ve been having lately, and my psychiatrist agrees with me: something is going on. What I don’t think I’ve mentioned is exactly what is going on. I’m having panic attacks. Unbidden, unrelenting, frequent and debilitating panic attacks. 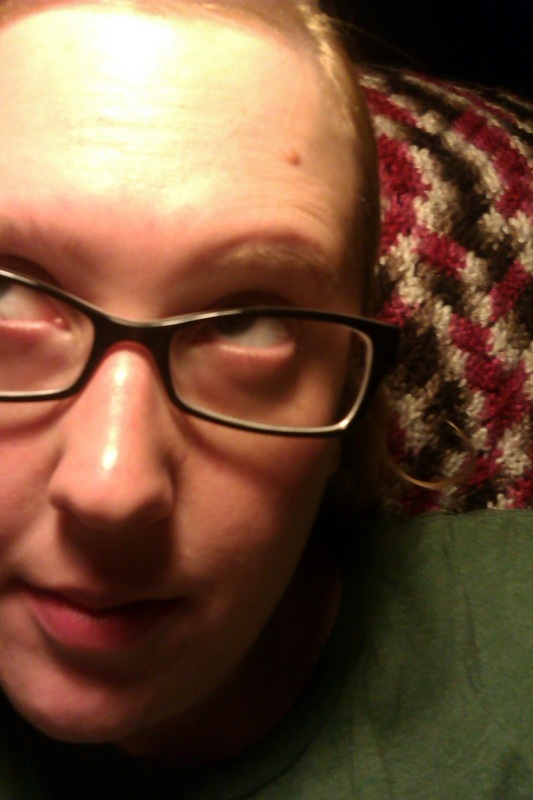 I barely made it across the road to the physiotherapist on Tuesday. Before my drive on Wednesday, I could not stop thinking about all the terrible things that could happen while I was behind the wheel. Neither of these instances was expected, and both of them are urgent enough to need dealt with promptly. My doctor has adjusted my meds and is setting me up with another psychologist to continue working through whatever is bottled up in my head. Since the pain associated with getting better (the scar tissue thing) can be feeding the anxieties just as terribly as the current and frequent “Acts of God” this province has experienced, we aren’t quite sure what is causing the recent and violent increase in these attacks. We can only make sure they are well-handled. And since all my tricks and techniques learned in CBT therapy weren’t working, I knew something had to be done. So, la. Now you know. If I’m flighty or spacey the next little while, you’ll forgive me, won’t you? I will try, really honestly try, to keep all of you updated as I go through this.